3 Bedroom End of Terrace House For Sale in Basildon for Guide Price £250,000. This deceivingly spacious family home offers any new owner a blank canvas. Internally this property is boasting with potential and is priced to sell. With a generous amount of living space that opens out into the rear garden, as well as 3 ample sized bedrooms and bathroom this end of terrace property has all the makings of a forever home. 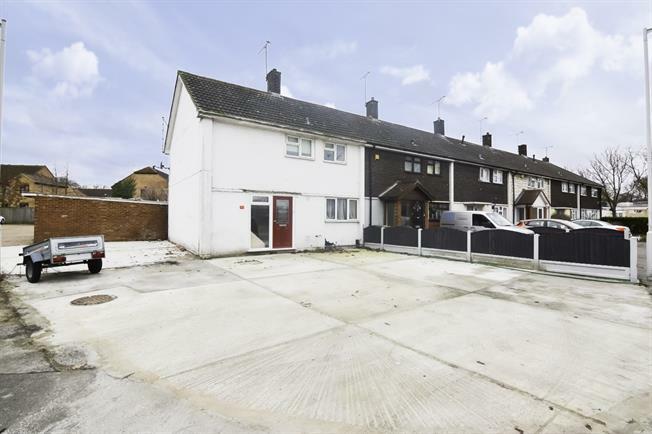 Externally the property sits on a corner plot making way for its tremendous amount of frontage allowing off street parking for multiple vehicles. Laminate flooring, painted plaster ceiling, original coving, ceiling light. Radiator, laminate flooring, built-in storage cupboard, part tiled walls, painted plaster ceiling, ceiling light. Roll edge work surface, wall and base units, one and a half bowl sink, space for, range oven, space for dishwasher. Double glazed window. Laminate flooring, ceiling light. Double glazed window. Carpeted flooring, built-in storage cupboard, ceiling light. Double glazed window. Radiator, laminate flooring, tiled splashbacks, spotlights. Standard WC, corner bath with mixer tap, shower over bath and corner shower, pedestal sink with mixer tap.